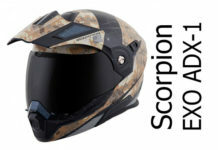 Home All Helmet Reviews Simpson Venom: whatever next, a mean and practical streetfighter helmet?! 1 Looking to buy this Simpson? 9 Best place to buy this Simpson crash helmet? 14 Good Alternatives to the Simpson Venom? 15 Looking to buy this Simpson? 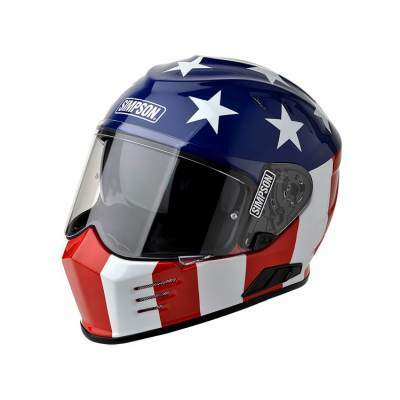 Simpson Venom/Ghost Bandit motorcycle helmet review. OK, so if you’re reading this and confused, that makes two of us! The Simpson Venom is the same helmet as the Ghost Bandit, only Simpson doesn’t have the rights to the Bandit name in Europe, so it’s called the Venom in the UK and Europe. Which also means that while the US Ghost Bandit is both ECE and DOT certified (so it’s legal in Europe as well as the US), the Venom is only ECE. There, glad that’s cleared up. And if you weren’t confused, you are now. Anyhow, we’ll call it the Simpson Venom now since we’re on our UK website (you can find our US website here). So what is the Venom all about? Well, it’s a full face helmet that comes in both composite fibre (cheaper) and carbon fibre (expensiver) variants. It looks cool as… well, as cool as we’ve come to expect a Simpson helmet to look. But this one has proper bike helmet features like a drop down sun visor and real, effective, venting. So now, you can look like Stig but still be wearing a proper bikers helmet. Happy days. Looking to buy this Simpson? 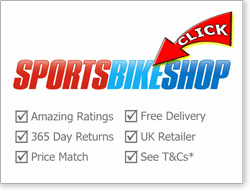 We recommend SportsBikeShop (UK) for competitive prices, free delivery, 365 day returns backed by outstanding reviews. 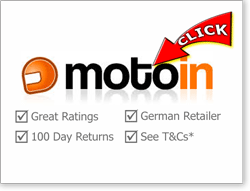 Or if you're happy to buy from Germany, Motoin are a quality operation with decent Euro prices and great review scores. 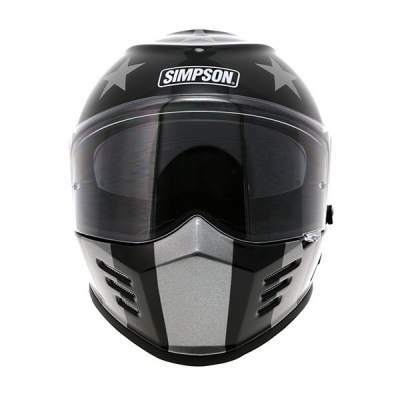 You can also click through to the Simpson helmets pages at Amazon if you prefer to buy from there or if you're in the US, Revzilla have amazing ratings, free delivery and a wide range of Simpsons in stock. 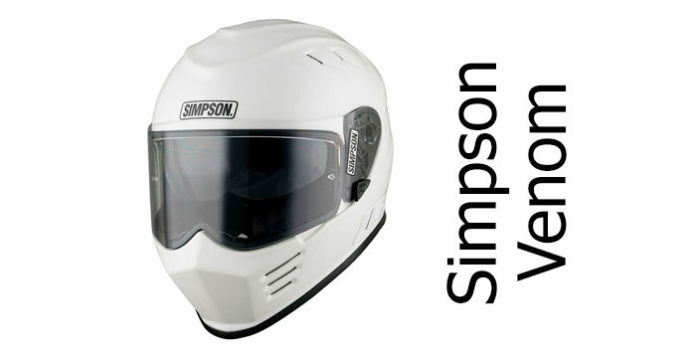 Please click any link to drop onto their Simpson helmets pages or see here for info on our recommended stores. There’s not much independent data out there on how safe Simpson helmets are. Sure they’ve a loooong pedigree of producing well rated helmets (particularly for car and Nascar racers) and their Outlaw Bandit has recently been Snell M2015 certified in the US. But the independent helmet testing folks at SHARP in the UK hadn’t tested any Simpson helmets. Until now. The tri-composite version of the Venom was tested and passed with flying colours – being awarded 4/5 stars for safety. That’s a fab score and from the looks of their 8.5m/s test graphics (below), it just dropped that star for a slight weakness on the sides (if a helmet’s gonna lose points, it’s often on the side impact testing). So that’s a great score. Remember, the Venom’s available in shells made from either carbon fibre (the expensive and slightly lighter version) or a Tricomposite of carbon, aramid and fibreglass that Simpson calls Maxx-3C. And it was that composite version that was tested by SHARP – though from past tests, we’d expect the carbon version to score at least as well as the composite helmet. So the stats say it’ll offer great protection. And with a nice wide visor aperture to give great vision, double d-ring fastener to keep it tightly in place, drop down sun visor for when the sun promises to dazzle and with a Pinlock ready visor (some stores include the Pinlock in the box too) there’s a number of other ways the Venom tries to keep you out of trouble too. Side view of the matt black Venom – traditional Simpson badassery! There’s a massive range of opinions out there on how noisy the Venom is – with about as many saying it’s loud as there are saying how quiet it is! Those who reckon it’s noisy say it’s probably because of all the vent holes letting air in around the shell as well as from beneath. They reckon fitting the chin curtain and closing the front vents helps a bit. But then lots of people coming from open face or very noisy helmets say it’s really quiet. Of course, if you do buy one, make sure you always wear decent ear plugs and it should be just fine. Sorry I can’t be more helpful – seems like it’s just one of those helmets where how you perceive the noise is is gonna be so dependent on your riding style and helmet history. 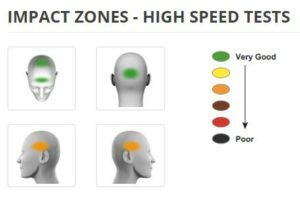 If having a quiet helmet’s your thing, you should check out our quietest motorcycle helmets page where you’ll find helmets where most owners say it’s a quiet helmet. Ventilation on the Venom is kinda dictated by the style of the helmet because Simpson has tried to keep the front clutter free. But apart from the obvious ones to each side of the chin guard, there’s also four small crown vents up top and a few exhaust vents to each side at the rear. All the vents look very similar from the outside – like always-open vents – and have meshes covering them to stop flies and dirt getting in. But those vents on the chin guard can actually be closed using sliders inside the chin bar. They’re a bit fiddly to open and close when the helmet’s on – mega fiddly when you’re on the move – and impossible when the chin curtain’s installed! But on the up side they do keep the external look of the helmet fuss free and cool-looking. All the other vents and exhausts (four of each) are always open and matched to a pretty comprehensive network of venting channels inside the helmet. Owners generally say the venom pulls in a good quantity of air to keep your head cool in warm weather… and the same in cold weather! The Venom has a really large visor that offers great peripheral vision and a reasonable amount of vertical vision too. It works on a ratchet for those of you who prefer ratchet visors, and it’s quick release so it’s easy to pull off and change/clean. Word is that the Venom’s slightly more prone to fogging than most helmets. And given most helmets fog up very easily, if you tend to ride in a season that’s not got an ‘ummer’ in it, or where it’s rainy or humid, you’re gonna want to get a Pinlock to stop the Venom fogging. Most sellers should include the Pinlock Max Vision in the box when you buy (the max vision is the biggest and best of the Pinlocks) but not all do so read the small print before you buy. If you buy one without the Pinlock, it’s going to cost you about £30 to buy one, so it’s worth checking. One thing that’s a bit more style over function (but then, that’s why you’re thinking of buying a Venom, isn’t it?!?) is that there isn’t an opening tab on the visor. Instead, there’s a small indent in the chin bar to allow just enough space to get the end of your glove in to open the visor. If you’re in summer gloves, owners say it’s OK and you get used to finding it. But things can get a bit fiddly in thick winter gloves by all accounts. Other than that, the visor system on the Venom works well. The sun visor drops down inside the helmet and stops you hitting walls/cars/kerbs when the sun’s low and you’re not wearing shades. Sun visors in helmets = a very good idea. The sun visor on the Venom is operated by a slider on the bottom left hand side of the helmet. The visor itself is medium tint but gives a decent amount of protection as well as additional UV protection to the main visor (all polycarbonate visors give 95%+ UV protection, and some quite a bit more). The only slight flaw is that a few riders said it doesn’t come down low enough, leaving a bright stripe across the bottom of your vision. The Simpson Venom has a fully removable and washable lining, and although there’s no word on any fancy fabrics or tech being used inside, owners universally say that it’s a really comfortable helmet. Like all helmets though, you need buy a helmet that caters for your head shape to get it fitting just right. The Simpson Venom is designed with most head shapes in mind – that’s medium oval heads that are slightly longer than they are wide. If that’s you, then you should be good with a Venom. If you’re thinking about ordering one, then the fitment sizes are mostly about right with just one or two people saying they needed a size smaller because Venoms are a bit on the large side. So we’d say maybe drop down a size if you’re inbetween sizes and not sure which size to order. And if you need to wear glasses while you ride, there’s no specific features in there to accommodate glasses but we’ve heard from a couple of owners who do saying there’s plenty of room inside for glasses. So, like most helmets, provided you’ve the right head shape for the Venom and provided you follow a decent fitting guide, then you should find the Venom a really comfortable helmet. Oh, and if you buy online, make sure you buy from a retailer who’ll exchange sizes without any quibbling (like all our named recommended sellers do!). See links below. If you’re thinking of buying a Simpson Venom (like I am!) you’re probably going to buy it because it looks so damn mean. Of course, to max out the meanness you’re gonna want to remove those Simpson logos, and according to one video I saw, the Simpson graphics are just stickers so with a bit of picking and elbow grease, they should come off. Happy days. OK, the black versions are probably the ones you’re going to go for. And there’s a bunch of plain matt/gloss blacks to choose from – as well as the plain black carbon fibre Venom. There’s also a starry black/silver Venom Subdued, as well as a plain gloss white stig-style helmet. In the US there’s a proper ‘out there’ stars and stripes Ghost Bandit Glory helmet, maybe to suit your Captain America style Panhead? As always, we’ve put a good range of the graphics available up and down the page, but to see more and find the latest deals, please use the links below to drop onto the Simpson Helmets pages at our recommended shops. 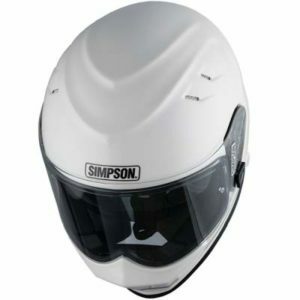 Best place to buy this Simpson crash helmet? 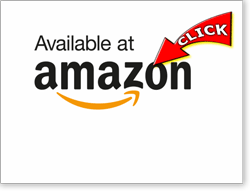 If you like to buy from Amazon you can click the link to drop straight onto their Simpson Helmets pages (just make sure you only buy from the most reputable sellers with the highest feedback). 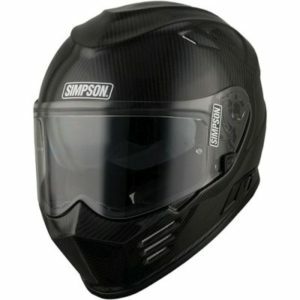 Please click any picture/link to drop straight onto their Simpson helmets pages. And if you buy from them, we get a small sum from the sale at no extra cost to you - a massive THANKS! (it's how we finance the site). Click here for more info on our recommended retailers. Click above to drop onto their Simpson helmets pages or *quick view retailer T&Cs here. A quick 2m video showing you around the US version of the Venom (called the Ghost Bandit over there). The Simpson Venom comes with a double-d ring fastener – old school but effective and have the benefit that you have to re-tighten them every time you put the helmet on. Inside the Venom are some generous speaker pockets so you should be sorted to install a bluetooth system. I’ve heard people happily fitting a Sena 20s or SMH5 in there with no problems. One thing that lots of owners say is that it feels a really light helmet – especially the full carbon version. The composite weighs about 1.4Kg (3.1lbs) which is far from the lightest helmet out there but it just about scrapes onto our lightest helmets pages. 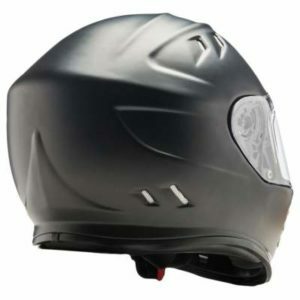 Another thing that owners like is that it’s an aerodynamic helmet with several riders saying they find it cuts through the air well and gives minimal buffeting, even when you’re looking over your shoulder. 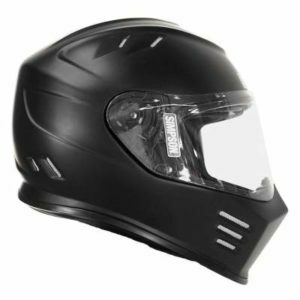 Many of us want a cool or mean looking helmet but they can be a massive compromise. But with the Simpson Venom, that’s no longer the case. Reminds you of someone? The gloss white Venom. 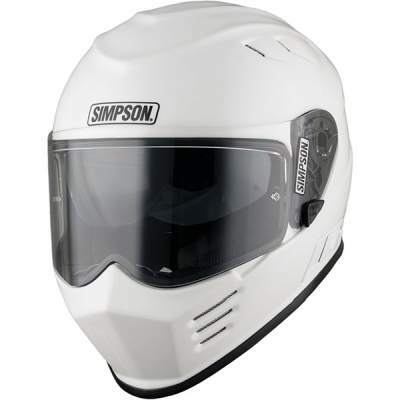 It’s got that classic Simpson Bandit look but now with decent ventilation, a quality visor system, light weight… all backed up with that excellent SHARP 4 star safety rating that means it’s gonna perform when you need it to. It’s even got a Pinlock and drop down sun visor for goodness sake! Owners tend to buy one because it looks sooo damn cool – but they also say it performs excellently. What we say is… if you love the look and you’ve got the cash, there’s really no reason not to buy one. The Simpson Venom is a great helmet. Good Alternatives to the Simpson Venom? So, you’re after something a bit different? A helmet that looks cool but works well too? Well how about these beauties..? First up, there’s the Shoei Ex-Zero. Word is that it’s a great helmet to live with, as well as a great looking retro helmet. 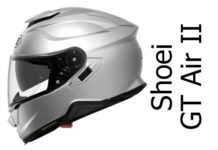 And of course it’s got that Shoei build quality backed by a 5 year warranty. Or how about the fibreglass Icon Airframe. Like most Icons, there’s some pretty ‘out there’ graphics but it’s a seriously practical helmet too and it’s about the same price as the Simpson. 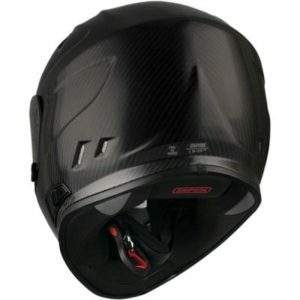 So too is the Shark Spartan – though like the other helmets, there’s a full carbon version that’s a bit more expensive. The carbon version is SHARP 4 star rated too and weighs under 1.3Kg. You can find other alternatives on our Coolest Crash Helmets pages or try using our smartish filters to zoom in on the main features you want in your next helmet. Folks buy the Simpson Venom not just because it looks great - it works great too! 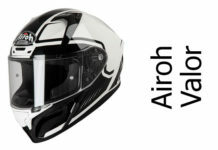 SHARP 4 star safety rated, light weight, comfortable, great visor system with sun visor - it ticks all the boxes and owners love them. It's not the cheapest but what price style like this? Go for it... it's a great helmet. Next articleAGV Compact ST: one of the safest modular helmets around?